Make a magical moment with this exquisite diamond ring from the Enchanted Disney Fine Jewelry collection inspired by Cinderella. Crafted in 9ct white gold, this wondrous style features a gleaming 1/4 carat of diamonds in a cluster formation and surrounding halo. The shank also dazzles with diamonds, while the bridge hosts an elegant filigree design. This ring will surely prove she is your princess. 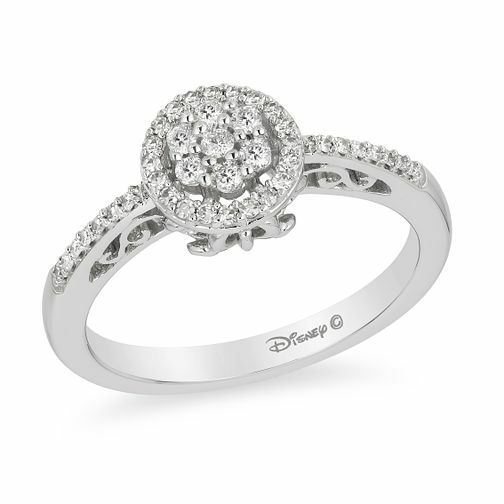 Enchanted Disney Fine Jewelry Diamond Cinderella Ring is rated 5.0 out of 5 by 3. Rated 5 out of 5 by Anonymous from Beautiful ring My fiancé proposed to me with this ring and I can’t stop looking at how beautiful it is. It is even nicer in person and so sparkly, great quality and looks very expensive. I have had nothing but compliments on my ring since getting engaged. Definitely worth the money. Rated 5 out of 5 by Anonymous from Beautiful, sparkly, everything my now fiance wanteda Beautiful ring, plenty of sparkle and so happy I choose this one. Also even happier knowing my better half said yes!